Add a touch of sophistication and modern flare to any kitchen with this Stylish stainless steel sinks are made of highly durable premium T-304 stainless steel stainless steel and they won’t stain, tarnish, or rust over time. They are also heat resistant and will not discolor from hot pans. They are easy-to-clean and resist bacteria. 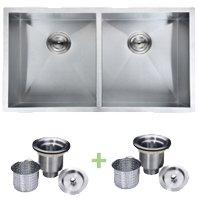 They come with heavy-duty sound deadening padding which result in a significant reduction in sound echoing that occurs with all non-padded stainless steel sinks. Supplied with fasteners and cut-out template and 2 luxury basket strainers. The Zero radius corners collection have been designed for those who prefer the ultra-modern aesthetic of “square” 90 degree corners as opposed to rounded corners. Drain grooves in the bottom of the sink’s basins add a stylish look and prevents pooling as water is directed towards the drain openings. Undermount installation required. The 18% of chrome content provides durability, maximum protection against rust and a beautiful satin finish. The 10% of nickel content provides excellent strength and harness.